Garden of Life, a product line that produces an excellent line of Certified Organic and Non-GMO Verified supplements, was bought by Nestle in late 2017. We stopped ordering their products the day after I found out about this corporate purchase. Like many multinational corporations, Nestle is using its wealth to purchase a smaller company that makes a good product line. These large corporations are buying up organic companies, plant-based companies, health product companies because they want to have a piece of the pie. Products that are different from their core line of products. Coca-Cola and Pepsico buying coconut water companies, Colgate bought Tom’s of Maine, Daiya Foods bought by Otsuka (a Japanese pharmaceutical company), Burt’s Bees bought by Clorox, Silk bought by Dean Foods and then Danone, Monsanto’s buying up of many of the larger organic seed companies, Green and Black’s sold out to Cadbury’s/Kraft, Seeds of Change food products, and seeds bought by Mars M & M, Amazon recently bought Whole Foods Market, Vega bought by Danone, Maple Leaf Foods purchase of Field Roast Grain Meats, and it goes on. More and more people are moving to organic, plant-based, and/or healthier items in their diet. It is one of fastest segments of the food industry. These corporations want to get a piece of the action and they will buy their way in with their profits. They can carry on polluting, unethical, industrial agriculture with the bulk of the business but also get the money from the greener side of things. Many of these corporate dinosaurs have made their overpackaged, overprocessed, and addictive (because of the addition of sugars, fats/oils, salt to appeal to our taste buds) products now see that there is a whole segment of the food industry that is growing and they are not a part of it. Well, money will buy you a seat at the table. Yes – we have some products on our shelves that are owned by large multinational corporations (Annie’s Homegrown/General Mills, Silk creamers – I have to do some more research and find out how they obtain their ingredients). We try and avoid or reduce those situations. If we are carrying something that you know is unethical, causes untoward hardship on the planet or a society, let us know and we will review it. 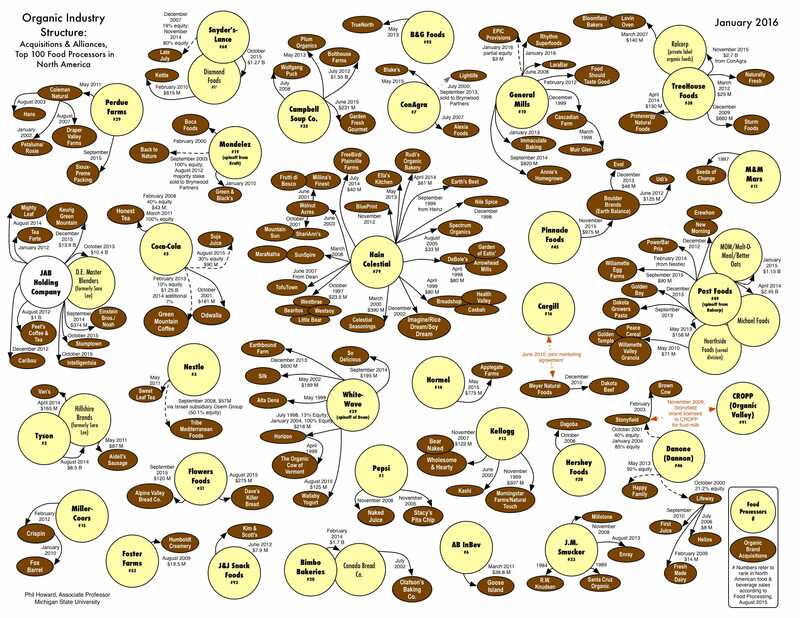 Check out this charge that shows you some of the who owns who in the organic food industry. In past years it was easy to link companies – like Kraft being owned by Marlboro cigarettes – and decide whether you were going to support a tobacco company or not. Now, many corporations are sitting on lots of cash and actually consolidating their hold on as many income-generating corporations as they can. I don’t blame them since that is what corporations do. They work to control the market, get as much market share as possible, and in the end – as much profit as possible. The following graphic is a testament to how far we have come. We identify businesses with their logo – their brand. The average person can recognize more corporate logos than plants and animals. This is just 10 companies. Over the years we dropped brands like Tom’s of Maine, Burt’s Bees, KeVita, Green & Black’s, etc. 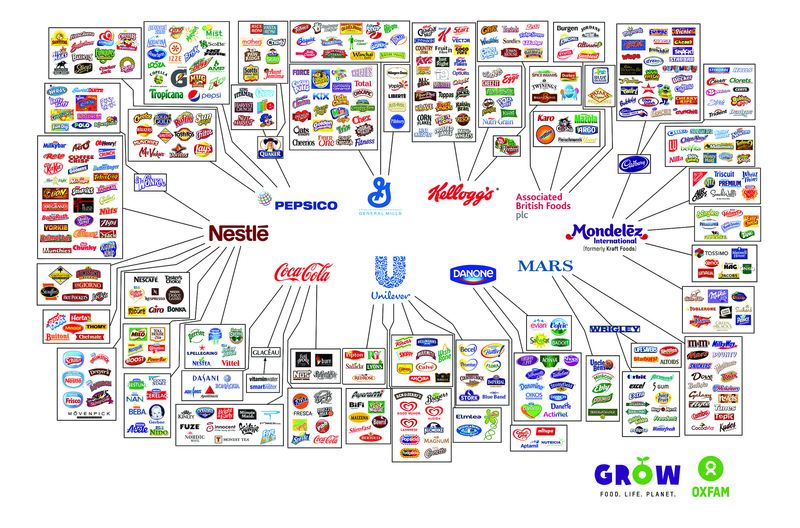 These were all items that were bought out by large corporations. Corporations that we did not wish to support. A year ago I brought in some Conimex products to add some more options to our condiment/Ethnic flavourings. One of the staff pointed out that it was owned by Unilever. I dropped the line. So, back to Garden of Life. We exhausted our present inventory and will not sell Garden of Life at our store any longer. This is a pity since we enjoyed having their product in our store because it was a ‘clean’ product but we do not want any of our money going to Nestle. I believe will lose business because of this decision since this product is being sold in our ‘competitor’ stores. When our former customers go to these stores to pick up their Garden of Life products they will likely spend some of their money there. We have no control over that. We only have control over what products we have in our store and we want to offer our customers the best but within our mandate – that the products have to be ethical, a benefit, and better than the average product. So, So long, Nestle! So Long, Garden of Life! We apologize to any customer that used to get this product from us and the inconvenience that this may cause you. Thank you for your support of this product line when we carried it and it was still a small Canadian company producing superior products. PS – a couple of my major issues with Nestle is their infant formula (marketing to new mothers – especially in developing countries) and their bottled water division. When my son was quite young, he would bring me a candy bar or some other candy package and ask me – “is this made by Nestle“. He knew I would not buy it for him then and I know I will not buy it for you to purchase from our store now.